The Rom or Romany people provide a particularly striking example of the notion that language is a key to a people's identity. Scattered all over the world in a diaspora which has lasted many centuries, the Rom are united only by a common origin for which their language has provided decisive proof. Subdivided into as many dialects as there are groups of Rom on the five continents, this common language bears the imprint of their travels and links them to India, their original homeland. What is remarkable, and what surprised the first students of the subject, is the persistence of grammatical forms which are in many ways similar to those of the Indo-European languages spoken in India today, and of a basic vocabulary which, in spite of certain phonetic changes, contains words found in Hindi, Punjabi, and the Dardic languages. This is not surprising. When, a thousand years or more ago, the nomadic ancestors of today's Rom began their long journey westwards, they often had to halt, sometimes for a long period, in regions where they lived in proximity to peoples of different languages and customs from whom they borrowed certain cultural and linguistic traits. As a rule, however, they did not stay in these countries long enough to become totally assimilated or to become so far integrated as to lose their identity or their originality. But even when they paused in a given region they continued to practise nomadism on a local scale. In the Middle East were groups which were given various names by their neighbours (such as Nawar in Palestine) but called themselves Dom. In Armenia they changed this name to Lom. A few decades later, in Greece, they became the Rom, a name they would retain throughout Europe and elsewhere in the world, thus breaking with their origins. The phonetic evolution of their ethnic name makes it possible to trace the history of the Rom right back to the beginning. Thus, the language spoken by European Rom today contains many words with an R; words quite similar to these are found in Indian languages, containing a corresponding phoneme, the cerebral d. There is even a group of Indian nomads today who call themselves the Dom. Many other nomadic peoples of India recall what must have been the origins of the European Rom. The most notable of these peoples are the Banjara and Lamana, who speak a language which is quite distinct from that of their European brothers and is closer to Hindi, for although they have remained in their country, their language has been influenced by the strong pressure of the sedentary culture. This explains its gradual divergence from the Rom language, while not invalidating what has been said above. The course followed by the European Rom was slow but inexorable. Their traversal of Asia did not leave a profound mark on their language, in spite of the affinity between Indian and Iranian languages. However, Romani Chib, the language of the Rom, undoubtedly contains Iranian and Armenian borrowings. Words of Iranian origin are found in all the dialects such as baxt (luck, fortune), ambrol (pear), khangeri (church), angustri (ring), ruv (wolf), vurdon (waggon). Words of Iranian or Armenian origin are: zor (strength), cikat (front). Words of Armenian origin are: bov (oven) and grast (horse). The language of the most westerly group of Rom was decisively influenced by their sojourn in Greece, which was probably one of their longest and which brought about the assimilation of a vocabulary and grammatical forms to be found later in all the Rom dialects of Europe. The following words are of Greek origin: drom (path, road), karfin (nail), klidi (key), kokalo (bone), papin (goose), petalos (horseshoe), tsox (skirt), zumi (soup), (v)amoni (anvil), and isviri (hammer). Many Rom dialects have morphemes of Greek origin including: -me, which is used to form the past participle (ramome: written; pahome: frozen; vezlime: embroidered) and -mos, which is used to form nouns derived from verbs or adjectives, taking the place of the suffix -pe, which is of Indian origin and is still used in certain dialects (pimos or pibe: beverage, from pi-: to drink; nevimos or nevipe: novelty, news, from nevo: new; ternimos or ternipe: youth, from terno: young; barvalimos or barvalipe: wealth, from barvalo: rich). The Romani vocabulary was enriched by many borrowings from the Slav languages, from Hungarian, from Romanian, from German, from Italian and from other European languages. The flexibility of Romani is also revealed in a capacity to create new forms, sometimes by means of astonishing combinations of words of different etymological origin. In one Sinto dialect, for instance, the word svigardaj (mother-in-law) has been composed from daj (mother a word of Indian origin, and an adaptation of the German word Schwieger (Schwieger-mutter: mother-in-law). 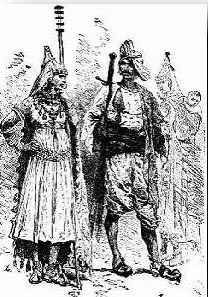 The word ledome (frozen) occurs in the dialect of a group of Muslim Gypsies in the south of Yugoslavia; it is composed of the Slav word led (ice) followed by the suffix me, which is of Greek origin, as we have seen. 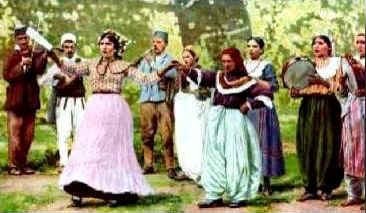 Thus, instead of degenerating, the language of the Gypsies changes in tune with a process similar to that undergone by other languages. Its vocabulary is enriched and adapts in accordance with new needs, changes in living conditions, periods and environments. But clearly this also makes the difficulties of understanding between the different groups more acute, since there is increasing divergence between the dialects. At least two-third of the world's three million Rom (this is the most conservative estimate; it is impossible to give precise statistics) speak the Danubian dialect which the English specialist B. Gilliat-Smith named Vlax, a term which emphasizes the notable Romanian contribution to its vocabulary but which is today perhaps no longer appropriate. Certain groups, in spite of their Rom origins, have abandoned their language and adopted that of their sedentary neighbours (one example is that of the Rudari and Romanian). The other dialects are presented in the following list, which is not exhaustive. It should also be remembered that classification by geographical groups is today only used for the sake of convenience, since these dialects have spread all over the world with those who use them. Iberian (today represented by Calo, the Hispano-Romani dialect of the Gitanos). According to a theory set forth by R.L. Turner, the origin of the Gypsies should, in view of their language, be sought in central India. Others maintain that they originated in northwestern India. Because of their constant mobility and the fact that at least ten centuries have gone by since their exodus from their homeland, it is difficult to say with certainty whether or not they originated in the Punjab. What is not in doubt is the number of Indian words that occur in the vocabulary of this so-called "European" people to express the most common concepts: house: kher (Hindi ghar) tree: rukh (Hindi rukh) salt: lon (Hindi lon) land: phuv (Hindi bhu) man: manus (Hindi manus) spoon: roj (Hindi doi) black: kalo (kala in Punjabi) white: parno (panar/parana in Dardic) young: terno (tarun in Hindi) walk: ga (Hindi ja) sleep: sov (Hindi so) outside: avri (Hindi bahir). In recent years a marked desire for union has appeared among the Rom of different countries; not for political or territorial union, but for cultural union based on their common origins and values. Although this movement is still restricted to a circle of intellectuals, there are some indications that it is growing. The problem of the unification of the Romani language has been discussed in various Rom congresses held in Paris, Rome, Geneva and Gottingen. For the moment this remains a legitimate but scarcely feasible aspiration; the unification of a language cannot be decided in an office, and it is not enough simply to discuss the theoretical side of the question. On the other hand, there is an increasingly widespread tendency to write in Romani, a language which has hitherto been oral. Not only are the words of Gypsy songs and fables being transcribed, but also "private" documents and even literary works which have little to do with traditional folklore. Periodicals are also being published and in Yugoslavia a Romani grammar written in Romani has been published. The study of Romani grammar is thus no longer the exclusive privilege of non-Rom students. Even though still confined to a handful of dialects, the publication of literary works in Romani and the propagation of the language in written form may be a first step towards its unification and may lead to a deeper self-awareness among this people in search of itself. Today this movement is contributing to a transformation of the traditional, not always positive, image, of the Gypsy (whether he be called a Tsigane, a Gitan, a Zigeuner, or a Cygan) with a view to his becoming a full member of modern society, strengthened by his culture and his capacity to communicate in his own language.